OCD or Obsessive Compulsive Disorder. Knock-knock-knock. You knock 3 in a steady manner. Every single wooden piece of furniture in your room needs to be knocked. You do it every night before you go to sleep. Lately, however, you’ve had to do it even more often than nighttime. Sometimes when you feel anxious or stressed you need to knock-knock-knock again. You don’t really know why you have to do it or the actual reason for it. Despite that, you have been doing this for years and it makes you feel distressed if you don’t do it. Eventually, you become isolated from people, leaving you all alone with the routines and the thoughts. That is one of the reasons why OCD or Obsessive-Compulsive Disorder needs to be treated as soon as possible. The routines might not bother you or others around you yet. They might even make you laugh as you realize the absurdity of them. But they can get worse and they do, in the majority of cases. OCD is a very specific disorder that is characterized by a variety of symptoms. If you show any of the symptoms that will be mentioned below, do see a professional. A specialist will be able to help you recognize and identify the root of your thoughts, obsessions, and routines. The 3 knocks every night is the one thing you’ve been doing the longest, however, you know that it doesn’t end there. Your TV, laptop and virtually any other electronic device need to be put on a volume that ends with a ‘0’ or a ‘5’ or you feel that anxiety again. You also feel anxiety when you think of germs surrounding you and the entire planet, you tend to clean quite a bit and carry around an antibacterial spray at all occasions. You don’t consider that habit to be as intrusive as the knocking, though. Despite that, you are able to live with a little dirtiness, however, it does tend to put you in the bad mood and make you quite irritated. All of these little quirks, as you call them, have not become a part of you and you cannot see yourself without them. OCD can materialize in a variety of different ways. People can show different symptoms, that might be unrelated to one another. 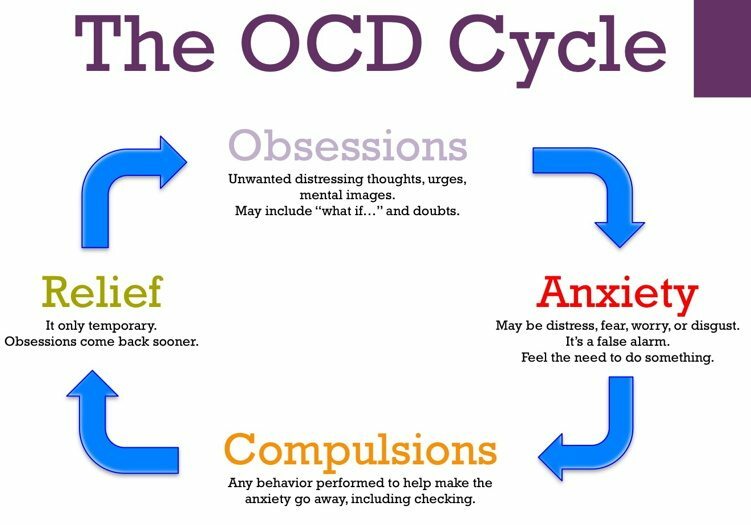 The majority of the adult population who suffers from OCD, however, tends to recognize their symptoms for what they are. Even after identifying these symptoms as a presence of Obsessive-Compulsive Disorder, they seem to not be able to overcome it. Before, OCD was considered to be one of the many types of anxiety disorders. Nowadays, according to the Statistic and Diagnostic Manual of Mental Disorders, clinicians put OCD into a category of its own. It’s a disorder that makes people go through a series of repetitive behaviors and obsessional thoughts. As mentioned before, the disorder can become quite detrimental to virtually every aspect of a person’s life. OCD appears equally in men and women, so there is no gender difference. It usually begins in childhood or when people reach their early adulthood. In order to diagnose Obsessive-Compulsive Disorder, a patient needs to display the symptoms for the amount of 2 weeks at minimum. The symptoms have to show to interfere with the person’s everyday life and routines. The person has to feel anxiety and distress when he or she shows the symptoms. OCD can creep up silently, through the back door. At first, it doesn’t seem that worrisome but later you start realizing that cleaning all the time doesn’t leave you time for anything else. Up to this date, research has not identified one single cause for the appearance of OCD. Despite that fact, it seems to be a combination of various reasons across different paradigms. Both biological and environmental factors can play a role in the development and progression of OCD. Biological factors include, but not limited to certain dysfunctions in various brain pathways. Apart from that, there seems to be a genetic factor present. Some patients have a genetic predisposition towards developing Obsessive-Compulsive Disorder due to the fact that their parents might have suffered from it. Apart from biological factors, environmental factors are quite important as well. They can contribute to an already formed biological predisposition and drive the disorder into action. Apart from causing OCD, situational factors can also increase the already present symptoms in a variety of individuals. Scientists have identified various environmental factors and associated them with OCD. The most common factors are a death of someone close, illness, change of a routine (moving out or moving away), different types of abuse, problems at work or with a partner. There are many more factors that can play a role and in different people manifest in different ways. Your routines promise relief from anxiety and stressful situations but that relief is momentary. The thoughts and the routines continue and they start haunting you, following you everywhere you go. They slowly seep into every moment of your life. OCD can fill you with meaningless routines and obsessions that can cover up the real problems you need to deal with in your life. Obsessions are thoughts, images or ideas that are constant, continual and repetitive. These obsessions occur outside of the person’s controls and are invasive. The thoughts are not rational but they make you want to engage in a certain activity as soon as possible. If you avoid acting in a way that your thought process wants you to, it can cause you extreme stress and anxiety. Ruminations: thoughts that happen for a very long time and they are unnecessary. People don’t want these thoughts to actually go away. These thoughts can range from philosophical to psychological to religious topics. Usually, there is no satisfaction from the thought process due to the questions being so philosophical. A person might spend a lot of time thinking and re-thinking the meaning of life and become detached from reality. Intrusive thoughts: repetitive and disturbing thoughts. May include a range of topics including causing violence, abusing somebody in various ways etc. These thoughts are involuntarily and the person cannot help them. The person realizes the absurdity and how horrific they are which causes severe anxiety and stress. Magical Thinking: anxiety and fear that the more you think of horrible things, the more there is a chance that they will occur. Relationships: fear about interpersonal relationships the person is engaged in. Religious: fear to cause something anti-religious in a religious setting or against God. Fear of committing a terrible sin. Compulsions are the actions or the repetitive behaviors that are caused by obsessions. By acting out on the thoughts and the unwanted images, the anxiety levels will elevate and give you momentary relief. Contamination: behavior that involves around cleanliness and washing. Afraid of yourself or others to be contaminated. Checking: fear to cause harm in forms of leaks, water taps, door locks, windows etc. Constant checking and re-checking. Orderliness: everything needs to be lined up in accordance to what feels perfect. Diagnosis of Obsessive-Compulsive Disorder happens in the presence of these 2 main symptoms. They have to show a great impact on your life. Obsessions have to be invasive, repetitive and constant and they have to cause anxiety. Despite the fact that they are so intrusive, the thoughts actually are not about the on-going problems about your life, but something completely different. You have to realize how ludicrous, absurd and over-the-top these obsessions are. You have tried to not think about it or to force the images away from your mind, however, failed at that. Look at how the OCD cycle works with these two important aspects. Compulsions need to be ritualistic in a way that they are repetitive and over-the top. You must feel the need to undergo the behaviors because you feel if you don’t, something unpleasant might happen. These intrusive behaviors are present for at least one hour every day. Executing these behaviors helps you decrease the feelings of intense anxiety that the obsessions cause. As mentioned before, many factors play a role in the development and progression of OCD. Environmental factors can cause or increase the disorder and its symptoms. Apart from the situational factors, however, there are certain biological and neural underpinnings that can be considered risk factors for the development of Obsessive-Compulsive Disorder. OCD is quite an interesting topic for researchers. Various different scientific studies over the years have attempted to look at the neuronal basis for the cause of the disease. Certain neuronal and genetic factors can play a big role. These factors contribute heavily to the development of the disorder. By knowing them, it is a lot easier to identify the target population and prevent the disorder from appearing in the first place. Scientists implement various neuroimaging methods in order to study these neuronal underpinnings in the brain. A lot of the studies are pinpointing some specific brain regions that seem to show activity during OCD related symptoms. These brain areas are the orbitofrontal cortex, the head of the caudate nucleus and the anterior cingulate cortex. (1) These areas show activity both in resting state in OCD patients and also when experiencing the symptoms. What is most important, however, is that these areas tend to show less activity after the patients undergo a certain amount of pharmacotherapy or psychotherapy. These areas connect with the basal ganglia through a special pathway. Many scientists support the view that the origin of OCD comes from the disparity in the pathway that passes through the basal ganglia. Many reports also say that OCD can appear following a brain injury, for example, if the lesion affects the orbitofrontal cortex or the basal ganglia. Therefore, we can see that scientists have made quite significant progress in finding the anatomical structures that seem to be responsible for the development and the progression of OCD. This does not, however, undermine the environmental and the situational factors. Many times, people report OCD as a result of a certain traumatic event or incident. As mentioned above, OCD used to be a part of the different types of anxiety disorders. There is a relationship and link between OCD and anxiety, as well as between OCD and depression. Overall, when speaking of mental disorders, there is quite a high comorbidity between a variety of them. OCD and anxiety seem to share a similarity between neural underpinnings and biomarkers and, environmental and situational factors. A variety of studies point to high comorbidity between the two disorders – people with one often have the other as well. Treatment strategies are quite similar as well. OCD tends to last longer than the majority of anxiety disorders (not all of them, however). It also can be a residue of a long-lasting anxiety disorder. Common symptoms include, but are not limited to, distress and worry. OCD obsessions bring severe anxiety in themselves. People with OCD also share symptoms with those diagnosed with depression by having thoughts of over-the-top guilt, inability to focus, sleeping and eating problems and suicidal thoughts. Often times people confuse OCD with OCPD due to certain similarities that don’t just end with the name. The confusion is not only among the general public but among specialists as well. In the end, professionals have agreed that the two are different mental disorders. First of all, and an important factor is that OCPD is a personality disorder. Symptoms include a maladaptive way of interpersonal relationships and dealing with unpleasant life situations. People who suffer from OCPD often keep a variety of organization techniques in their attempt to achieve perfectionism. They want to have control over themselves and everything that surrounds them. In their attempt at over-organization and unending lists, they often forget the reason for doing something. They devote themselves to their work, often forgetting about people who are close to them. They also do not accept any change in their ethical values and the morals they’ve been brought up with. OCD tends to be more related to anxiety than that of a personality disorder. Obsessions and compulsions in their real way do not seem to appear in OCPD. In OCD, people perform behaviors in order to decrease intense anxiety. In OCPD certain repetitive behaviors are not done in order to reduce stress and feelings of distress. Instead, people suffering from OCPD perform these behaviors in their strive for perfectionism. This leads to the fact that they actually see the benefit in the majority of the behaviors. On the other hand, people diagnosed with OCD realize the maladaptiveness of the compulsions. Many children nowadays find themselves in trouble with the distressing symptoms of OCD. It is important to understand that children who show these symptoms are not doing so to gain attention. They are experiencing anxiety, stress, and depression in a similar way that any adult with Obsessive-Compulsive Disorder would. Children, of course, will not understand the true implications of OCD. They will not understand the compulsions as being really bad. Children do, however, realize that the obsessions are bad and they cause them severe anxiety but might not be able to word it correctly. If your child is experiencing symptoms of Obsessive-Compulsive Disorder it is important for you as a parent to see a professional. A specialist will help to design and implement the best treatment strategy. Various treatments are available for those suffering from Obsessive-Compulsive Disorder. A lot of times, the treatment does not result in an overall cure of the disorder, however, does relieve of the intensity and severity of the symptoms. It is important for the individual to learn how to be able to return to their daily life and not let the obsessions and compulsions overtake every second of every day. Two main treatment strategies include pharmacotherapy and psychotherapy. In many cases, clinicians will suggest a combination of both therapy and pharmaceutical intervention. Cognitive-behavioral therapy is a common type of therapy for those affected with Obsessive-Compulsive Disorder. A particular type of cognitive-behavioral therapy – exposure and response prevention – seems to work the best. Clinicians will expose the patients to the object that brings the most distress (dirt for people obsessed with germs). Clinicians will try to help with the feelings of anxiety that arise. OCD patients are often given medication to deal with symptoms. For the medications to work they must be taken regularly and directed by a doctor. Side effects can be a big issue for OCD patients leading them to stop taking the medication. Research has shown that Serotonin Reuptake Inhibitor (SRI) are the most effective drugs for OCD patients. They are antidepressants but also help address OCD symptoms such as obsessive thoughts and even some compulsive behaviors. Your symptoms: Being specific about your symptoms can help the doctor uncover the right medication and dosage for you. Side effects: All psychiatric medicines have side effects. Ask your doctor about possible side effects of the pills prescribed and how long should it take for you to notice them. Suicide risk: Some antidepressant might lead to suicidal thoughts or behavior. If you are experiencing suicidal thoughts contact your doctor immediately for help. Stopping medication: Before making any rash decisions, remember that regardless of the side effects, the medication is also maintaining certain aspects and might not be convenient to stop it abruptly. Contact your doctor to see what are the best options to decrease your medicine slowly. Counter effects: Ask your doctor if the medication can have counter effects with other medicines or natural supplements. In some situations, doctors may add an antipsychotic with the antidepressants. Usually, it can be first- or second-generation antipsychotics, but the evidence is stronger for the newer drugs. Studies indicate that 40% to 55% of patients with OCD, after failing to respond to a first treatment, do improve when an antipsychotic is added to an SRI — although residual symptoms may remain. Bloch et al. concluded however that the antipsychotics be administered after three months of solely taking the SRI. Bear in mind that an antipsychotic used to augment OCD treatment should be prescribed at the lower end of the dosing range. At high doses or when prescribed alone antipsychotics may worsen OCD symptom. Even if not tested yet on OCD patients directly, some antipsychotics have proven to have OCD symptom related side effects. OCD is considered to be a chronic condition. In 1988, a total of 560 patients were studied out of which 85% had a continuous course of symptoms, 10% worsened and only 2% established full remissions lasting six months or more. Lensi et al. recently reported more patients courses (26% episodic, 9% deteriorative, and 64% chronic). These studies indicate that regardless of therapies OCD is a persistent disorder. However, even though, OCD can have quite a detrimental effect on the quality of life. With the proper treatment, however, it is possible to get the symptoms under control. Various factors that give good prognosis include the decrease of symptoms and a shorter duration of them. Obsessive-Compulsive Disorder is quite a famous disorder in the public eye. Therefore, it’s common appearance in the media comes as no surprise. Many famous people have spoken about their battle with Obsessive-Compulsive Disorder as well. You will hear famous names like Howie Mandel and Cameron Diaz and their battle against germs. Justin Timberlake is all about organization, Katy Perry needs to brush her teeth about 5 times a day. In the end, I will leave you with little clips from famous movies and TV shows and famous characters displaying quite recognizable symptoms of OCD. Hope you enjoyed this article and feel free to leave a comment below! Maia T V, Cooney RE, Peterson BS. The neural basis of obsessive-compulsive disorder in children and adults. Dev Psychopathol. 2008;20(4):1251–83. Goodwin GM. The overlap between anxiety, depression, and obsessive-compulsive disorder. Dialogues Clin Neurosci. 2015;17(3):249–60.